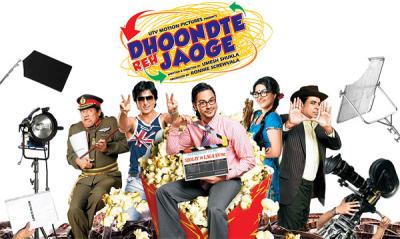 Dhoondte Reh Jaoge is a boring, immature remake of Mel Brooks’ The Producers. Skip it unless you’re an avid Bollywood fan, and even then, keep your expectations low. As in Brooks’ movie, a washed-up producer and a penniless accountant try to swindle their investors out of money by making a film guaranteed to flop. Considering that the duo spend the first forty minutes of the film trying to get each other arrested, there’s no reason for the two of them to work together — except that the plot demands it. The pair hire a Pakistani nationalist to write a film with political undertones, certain to outrage the Indian public. The writer combines plot elements from Bollywood hits like Sholay, Lagaan and Dilwale Dulhania Le Jayenge into an absurd story, further hampering the film’s chances for success. There are a few amusing scenes in the film-within-the-film, such as the Lagaan-inspired cricket match ending. But the scenes are only funny if you’ve seen the movies being lampooned. The rest of Dhoondte Reh Jaoge is slow, and the jokes are more offensive than they are funny. Save a few bucks and rent the original version of The Producers. This entry was posted in Reviews and tagged 1.5 Stars, 2009, Bollywood, Dhoondte Reh Jaaoge, Dhoondte Reh Jaoge, Dilwale Dulhania Le Jayenge, Hindi, Lagaan, Mel Brooks, Sholay, The Producers on March 8, 2009 by Kathy. For the weekend starting Friday, March 6, the AMC South Barrington 30 is the place for all things Bollywood in the Chicago area. The theater is carrying over Billu Barber and Delhi-6 as well as bringing in two new movies, 13B and Dhoondte Reh Jaoge. The AMC Cantera 30 in Warrenville will carry over Delhi-6. 13B is a thriller about a family terrorized by their television set. Fortunately the TV set deals in psychological terror, not the appliances-come-to-life kind of terror from Maximum Overdrive. Dhoondte Reh Jaoge is about a couple of guys who try to cash in by making a film guaranteed to flop. The plot sounds a lot like the movie The Producers, and the zany look of the film’s website concerns me — filmmakers sometimes mistake “zany” for “funny”. This entry was posted in Weekly Theater Updates and tagged 13-B, 13B, 2009, AMC Cantera 30, AMC South Barrington 30, Billu Barber, Bollywood, Chicago, Delhi-6, Dhoondte Reh Jaaoge, Dhoondte Reh Jaoge, Hindi, Maximum Overdrive, South Barrington, The Producers, Warrenville on March 4, 2009 by Kathy.